This image (thank you Rochelle Logan!) details my attempt to describe to my public library board of trustees, and the public generally, just what we do. Not what we say we do, or think we do. What we can actually measure. Note: you may have to click on the image to make it large enough to see clearly. I began by sorting (by descending volume) of all the statistics my library (the Douglas County Libraries in Douglas County, Colorado) gathered in the year 2010 (January-December). There are seven broad categories of use that far overshadow everything else. AFTER these stats, it's a drop of an order of magnitude (a factor of ten). This is what my library DOES. * in-library use. There are a lot of people -- reflected in the door count -- who come to the library who might not do anything captured anywhere else. If they come in and hang out, chat with friends, talk to staff, maybe even use a study room, read a few magazines, and leave, we don't really capture it. I have several questions. The main one is this: is the experience of Douglas County Libraries similar to that of other libraries? If so, these ratios of use may help us in our planning efforts. I've asked my colleague Nicolle Steffens of the Library Research Service to look at that in her spare time (of which there may be zero!). I'd be interested to hear from other libraries -- and library users -- about this picture of library use. Does it match your experience? Is there anything that surprises you? Anything that YOU think is missing? Anyhow, here's the picture: one big thing, two roughly equal things (library as physical and virtual hub), and four other key services, also roughly equal to each other. * P-visits is the number of physical visits (doorcount divided by two). * Ref is the number of reference questions staff responds to in a year. * Database use is the number of unique searches in one of our subscription databases. Most of these come from the public, not from the staff. * Prog attend is program attendance - the number of bodies who show up for our library-sponsored programs. It does not include meeting room attendance. * PC is the number of unique logins for use of our public PCs. Do you think that PC area would be larger if you had more PCs available? Is the resource limiting it? It does not necessarily in the library where I currently work, but I know it's a factor in my communities library where the demand ALWAYS exceeds the availability of PCs. Very interesting. Aurora Public is only different in its circulation and computer use. 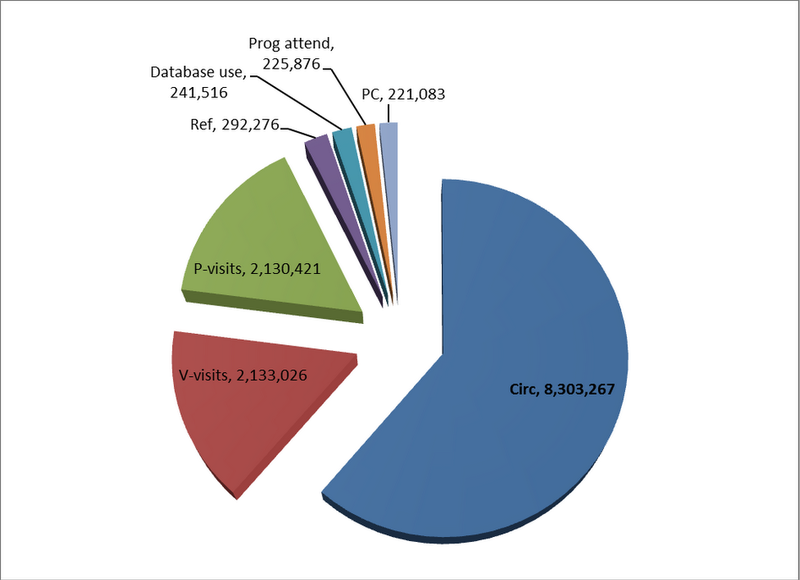 At APL, # of p-visits are almost the same as the circulation number (due to our significant materials budget decrease). Our PC use to p-visits is a 1:3 ratio. On another note, where do you count downloadables? While we all grapple with ever changing service models, technology, revenue sources and expectations from our public, at the Arapahoe Library Distict (ALD) we also question are we counting the services that matter most to our users. Further are we collecting data that allows us to effectively plan for changing library use. We recently emabarked on a study to gauge how ALD patrons use today's public library. Based upon a recent study at the Cincinnati Public Library, we are just starting to collect statistics at our two largest branches, Koelbel and Smoky Hill. Reaerachers armed with data collection sheets will walk through the libraries at 56 different times from July through October. They will count the number of users by age in each area of the library and using 15 different activities describe what the user is doing in each area. In 2012 we plan on expanding the study to all branches and perhaps enhancing our data with focus groups. Our data will add a richness to "the Seven Things We Do". As a corollary to the usage studies we are also conducting, efficiency studies using the "Lean for Service" approach in all our libaries. Jamie's question regarding "in-library" use is right on target with our concerns. Melissa: it appears that PC use is actually falling. We monitor how many empty stations there are, and that number is increasing. Is it because we're seeing a shift to laptop and phone use? CassiP: local variation, and that makes sense. I really don't know how common our ratios are. We count downloadables as circulation. And that number is rising sharply, even as others, this year, seem to be falling. Laurie: I'm sure your approach will tease out interesting facts. I look forward to seeing what you learn. But I also think we have to remember the issue of volume. Most of our resources should be directed to the strongest demand, yes?